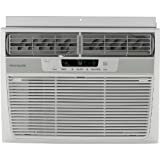 Frigidaire's FRA082AT7 8,000 BTU Mini Compact Window Air Conditioner is perfect for rooms up to 350 square feet. This unit features mechanical rotary controls and low voltage start-up protection. The anti-bacterial filter reduces bacteria, room odors, and other airborne particles for a comfortable environment. With Energy Star efficiency, this unit provides savings along with cool, quiet comfort. Get year-round heating and cooling comfort with one portable AC! The NewAir AC-10100H portable air conditioner and heater offers a 4-in-1 design. It provides 10,000 BTUs of cooling power, which is ideal for cooling spaces up to 325 square feet. Plus, it also functions as a heater, dehumidifier and fan! Ultra Compact Design At approximately 12.13� L x 15.13� W x 29.75� H, this portable ac is small enough to fit in almost any space. Self-Evaporative Cooling The NewAir AC-10100H portable ac is built with self-evaporative cooling technology that removes water from the air to cool the condenser coils. This increase cooling efficiency and reduces the water that collects in the tank, so you won't have to empty it as often. 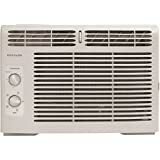 Covers 325 Square Feet The NewAir AC-10100H is a 10,000 BTU air conditioner that is perfect for cooling rooms up to 325 square feet. It's perfect for small apartments, home offices and other indoor spaces! Easy to Operate Enjoy complete convenience with the NewAir AC-10100H portable AC and heater! It features a LCD display and electronic control panel makes it easy to program all the features. It also includes a 12-hour timer, sleep mode function, and auto-fan mode to customize your cooling and heating preferences. 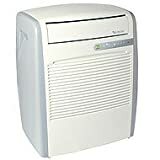 The EdgeStar 8,000 BTU Portable Air Conditioner (AP8000W) is an ultra-compact portable air conditioner that delivers a frigid blast of cold air and fits in almost any space. This compact portable air conditioner is stocked full of features. It is capable of cooling up to a 225 square foot room, while offering a dehumidifying function and three speed fan. The EdgeStar AP8000W portable air conditioner is our value choice pick for those customers that are looking for a great price, but don't want to sacrifice quality or features in their purchasing decision. This EdgeStar portable air conditioner also has an adjustable 24 hour timer, so you can set it and forget it. This is a great unit for situations in which you need a stylish unit that provides powerful cooling and versatile operation. This portable air conditioner is environmental friendly and meets new RoHS standards. RoHS, also known as the lead-free directive, stands for Restriction of Hazardous Substances. The goal of RoHS is to restrict the amount of certain toxins in electronic and electrical equipment such as lead, mercury, and cadmium. This restriction lessens the harmful impact these toxins can have on the environment and allows for the safer disposal and recycling of electronics and electrical equipment. 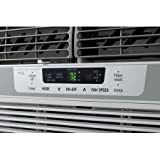 Frigidaire's FFRA1222Q1 12,000 BTU 115V Window-Mounted Compact Air Conditioner is perfect for cooling a room up to 550 square feet. It quickly cools the room on hot days and quiet operation keeps you cool without keeping you awake. Low power start-up conserves energy and saves you money. Ready-Select electronic controls allow you to set the comfort level to your preference, while a convenient temperature-readout displays the set temperature. A full-function remote control allows you to precisely control the temperature and fan speed from across the room. The multi-speed fan features three different speeds for more cooling flexibility and the 8-way comfort control design allows you to easily control the direction of the cool air, wherever the unit is mounted. Plus, the antibacterial mesh filter with front, tilt-out access reduces bacteria, room odors and other airborne particles for a healthier, more comfortable environment. There are particles in the air that can be a threat to our health whether it's indoor or outdoor which can trigger an asthma attack, allergies and other chronic respiratory tract allergies. The travanovas car air ionizer purifier has been developed using the latest technology and unique innovation to achieve the best air purification. It releases 4.8 Million negative ions per cm³ in your car for massive odor-fighting power to protect your health against invisible air particles and bacteria such as dust, microbes, smoke, benzene, formaldehyde and many more. By eliminating the bacteria, viruses and other unpleasant odors, it generates safe ozone and improves air quality. Making your car ventilation safe, not just for you but, for your loved ones too. Our auto air ionizer is very easy to use; just plug the device into a car adapter and a blue LED light illuminates to indicate the device is working. The ionizer will work continuously until it is unplugged. The travanovas car air ionizer purifier has undergone meticulous tests by our manufacturer & expert of air purifiers from china and has obtained the approval from CE (conformité européenne), FCC (federal communications commission), and RoHS (restriction of hazardous substances). 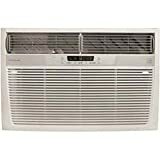 With Frigidaire's FFRH0822Q1 8,000 BTU 115V Compact Slide-Out Chassis Air Conditioner/Heat Pump you have an easier window installation option. 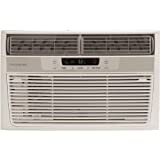 First, install the outer cabinet of the AC in the window and then slide the interior of the air conditioner into place. This unit can also be used for wall installation. Designed for a room up to 350 square feet, this unit gives you both heating and cooling solutions for year round comfort. Quiet operation keeps you comfortable without keeping you awake. Plus, with the 24-hour on/off timer, you can ensure the room will be comfortable when you want it to be without having to worry about running up your utility bills. The built-in timer allows you to preset the unit to turn on and off in half-hour increments. Additional money-saving features include Energy Saver mode and Sleep Mode.